Made from 90% bamboo fiber and 10% cotton, Hahnemuhle's Bamboo Fine Art Paper, available here as a 44" x 39' roll, offers a matte natural white surface well suited for warm-toned images and monochrome prints. It delivers a basis weight of 290 gsm along with a thickness of 19.7 mil for a good weight and feel. Also, it has a rated opacity of 99%, a whiteness of 83%, and does not use any optical brightening agents for maximum longevity. Additionally, it is acid free, calcium carbonate buffered, instant drying, and has a high water resistance. Box Dimensions (LxWxH) 46.5 x 5.5 x 5.5"
Bamboo Fine Art Paper (44" x 39' Roll) is rated 5.0 out of 5 by 3. 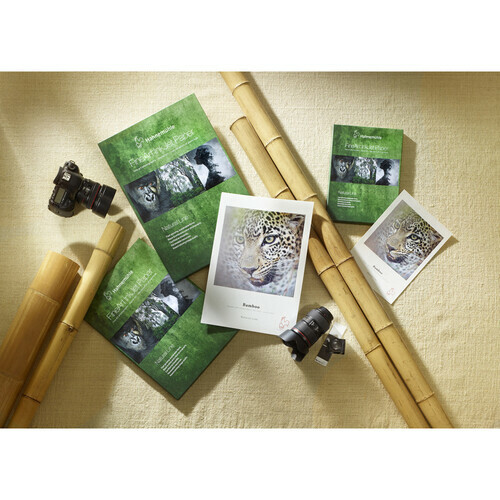 Rated 5 out of 5 by Anonymous from Bamboo is beautiful We specialize in printing artists work to their satisfaction. Bamboo from Hahnemuhle not only satisfies them but delights as well. The B&Ws come out with beautiful tonal scales and the color images are brilliant with just the right touch of warmth. The artist we just printed for is showing 20 prints on Bamboo in a one woman show in 2 weeks and is thrilled.